I really enjoyed watching the latest Nigella series on TV – Nigellisma. Not just because I love the way she talks about food and that she always borders on the wholly-inappropriate-for-pre-watershed-telly, but because she ends up inspiring me to cook something that I would never have looked at twice from the book. 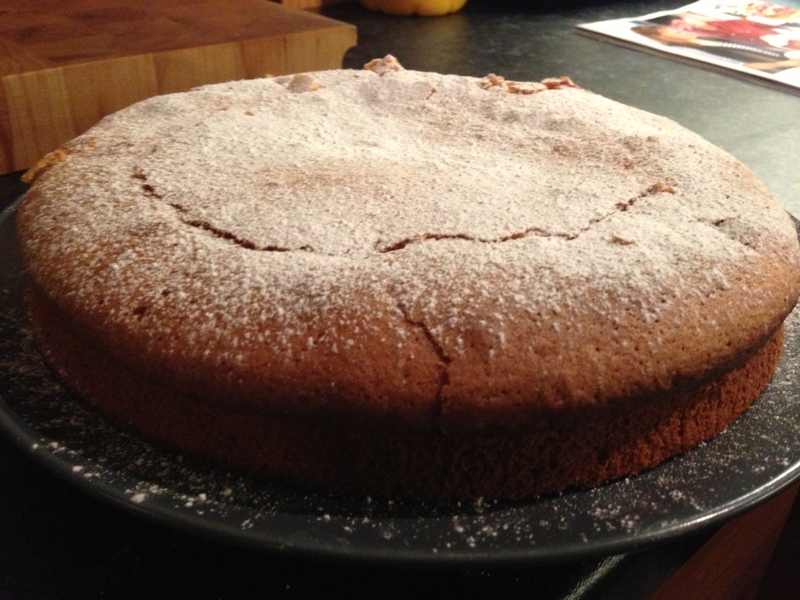 Step up, Nigella’s Yogurt Pot Cake. The concept of this cake is that you take a regular-sized yogurt pot (150ml) and use it as an easy way to measure all the other ingredients. Unfortunately, trying to find a regular sized pot of yogurt in the East End of London proved too much – most of the yogurt pots were so large they had handles. Like paint pots. Seriously, how much yogurt does one family need? But anyway, Nigella thankfully preempted this potential problem and listed proper measurements too. As I said, I would have flicked past this recipe had I not seen this being made during the series, and I’m so glad I tried it. Nigella suggests baking this in a 22cm savarin or ring mould, which I don’t have. But she also suggests a regular 22cm springform tin works fine, which is what I used. I’ve not had any experience of baking with yogurt and oil, so I’m not 100% sure if my cake came out ‘right’ or not, although I would say it was lovely. It didn’t rise to great heights, and wasn’t hugely crumbly, but it did taste wonderfully light with the lemon and vanilla working well together. It reminded me of a denser madeira cake. I’d like to think that’s what the cake is meant to turn out like, and not that I should have whipped the egg whites more before adding! Preheat the oven to 180C/gas mark 4, and grease your ring mould or springform tin using vegetable oil. Separate the eggs and put the whites into one bowl and the yolks in another. Whisk the whites until they are firm peaks. Set aside. Scrape the yogurt onto the egg yolks, and use the yogurt pot to measure the other ingredients (or use the measurements provided above). So add 2 pots (just) of sugar and whisk with the egg yolks and yogurt until airy and light. Fill the yogurt pot up with vegetable oil and, beating the whole time, slowly add to the egg yolk mixture. Then beat in the vanilla extract and lemon zest. Still beating, add in 2 pots of flour, followed by 1 pot of cornflour. Scrape down and fold in with a rubber spatula. Now with a large metal spoon, dollop in the egg whites and fold them in with the spatula. Fill the mould/tin with the batter and bake in the oven for 30-35 mins. When cooked the sides will be coming away from the sides and a metal skewer or cake tester will come out clean. Remove from the oven, transfer to a wire rack and let the cake sit in the tin for 10 mins before turning it out. Once cooled, put onto a serving point and sprinkle over icing sugar. Categories: Cakes & Baking, Reidbury Recipes | Tags: Cake, Cakes & Baking, Desserts, Nigella Lawson, Nigellissima | Permalink. That looks delicious, and I love the concept. Sometimes weighing is just entirely too much effort. Exactly! Typical Nigella finding a lazier way to bake!